This ceramic vessel was collected by a Cordry Intern in 2001 from the maker in San Vicente on the Nicoya Peninsula in Costa Rica. It is an excellent example of the revived ceramics tradition being practiced by the indigenous people of the area. Potters in this region have rediscovered ancient ceramic traditions, and are often basing their work on photographs of prehistoric pieces in public and private collections. The ceramics are sold largely to tourists. 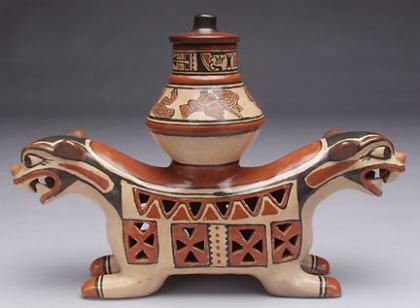 This incense burner is a modern replica of an ancient piece dating from 1000 - 1500 CE and is part of a tradition called the Greater Nicoya Style. The pottery is fired under low temperatures, leaving the ceramic body fragile and easily broken. The body of the ceramic was hand - built and the two heads were made in a mold. The decoration consists of incising, piercing, cutting and modeling. The surface treatment is a combination of red, ochre, and white slips (baked on clay washes) and black paint. It was shipped from Costa Rica with inadequate packing materials and broke in transit. One head was smashed into fragments. After the piece was accessioned it was brought to Conservation for treatment. Conservation carefully records the damaged condition and each step of reconstruction in a "treatment report". The report includes photographs, drawings and written details of everything that is done to the piece. The report is analogous to a medical record. Photographs are taken of the ceramic before treatment is begun. The broken ceramic is shown here with fragments prior to reconstruction. The documentation continues during treatment of the object. The fragments are reassembled and adhered into place with adhesive. We are very careful with the adhesives we use, taking care to use one that is compatible with the base material (ceramic), yet which can be completely removed if necessary. Once the piece is reconstructed, the losses can be identified and filled. We use plaster of Paris or a synthetic spackling compound to fill the gaps. That is the white material that can be seen in the cracks. The final stage of restoration is to paint the repaired areas to reduce the visual impact of the repair and provide the viewer with as complete a view of the original piece as possible. In a modern piece, such as this one, it was decided to do the painting so that it was difficult to see the repair. With archaeological ceramics we usually paint the repaired or replicated areas so that they are visually different than the original pots to reduce confusion. Detailed notes and photographs document the entire process. Can you see the repairs in the finished piece?